Magnus Carlsen has beaten Vishy Anand in their first encounter since the World Championship match last November after a game that was balanced on a knife-edge suddenly ended with a 32nd move blunder. 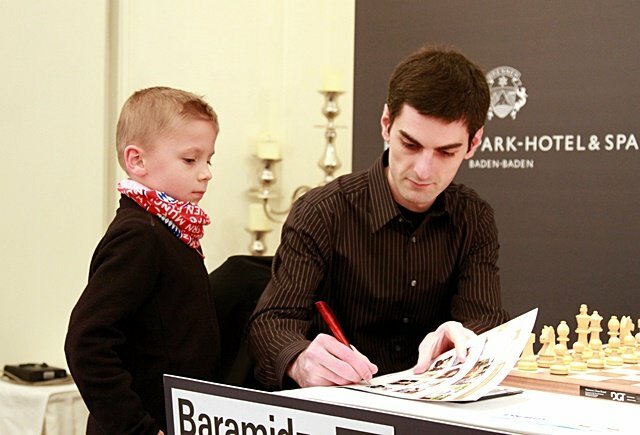 The World Champion joins Fabiano Caruana in second place behind Arkadij Naiditsch, who took advantage of David Baramidze overstepping the mark separating genius from madness. Once again the game of the day by far in Baden-Baden involved the World Champion Magnus Carlsen, so let’s again save that to last and take a quick look at the remaining action. 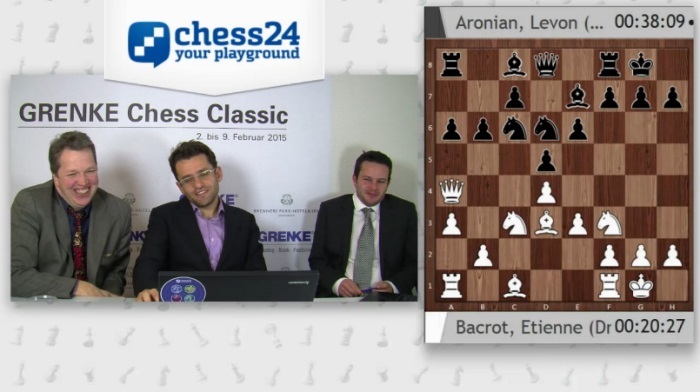 Aronian showed that here Qxc6 fails to Bd7! to which Short responded: "That's basically the most exciting thing we've seen in the game... and it didn't happen!" It's curious to note that Nxd5! here does allow Qxc6 next move. Watching the mayhem unfolding on other boards Levon Aronian noted, “at least somebody has to be super-solid”. His 9…Nb8 knight retreat looked a little outlandish at first glance, but he confirmed he’d prepared it and Etienne Bacrot failed to find any refutation at the board. An uneventful draw by repetition was soon reached on move 30, which had the bonus of giving us some brilliant stand-in commentators for the other games. David Baramidze’s impressive start in Baden-Baden is history, after two calamitous losses in a row. Perhaps inspired by events on other boards Arkadij Naiditsch played a “delayed Dutch” with 6…f5 and the game had soon left known theory. Both players were getting creative even before Baramidze opted for 18.f3!? Sadly, though, a potentially spectacular game was stopped dead in its tracks by 23.Ng6? ?, played after 2 minutes and 52 seconds. It was the second time in two days David had jettisoned a knight for no compensation. After 23…Nxg6 24.Qxf5 White would be doing fine (Black has a lot of pieces that can be picked up with check), if it wasn’t for the retreat 24…Ne7!, which cuts out all the fun. Naiditsch took less than a minute to play that winning move, and the speed with which Baramidze stumbled on for a few more moves made it clear he knew the game was up. It’s too much talent, I guess… I can’t really explain the blunders, because I’m a big fan of them myself! Caruana was critical of his 25.Bf3 here, but probably unfairly, since it seems it’s simply a difficult advantage to convert into a win – Black's pieces are all poisoned to take up good squares and Adams lived up to his tricky Mickey (or Spiderman, if you prefer!) reputation in the moves that followed. The players repeated on move 43, leaving Adams on 50% and Caruana in second place with Carlsen. He hasn’t played it, and his seconds haven’t played it too much either! He also joked that at least if there was a pawn on f5 he wouldn’t be tempted to try the now infamous #Bxg4WTF any time soon. 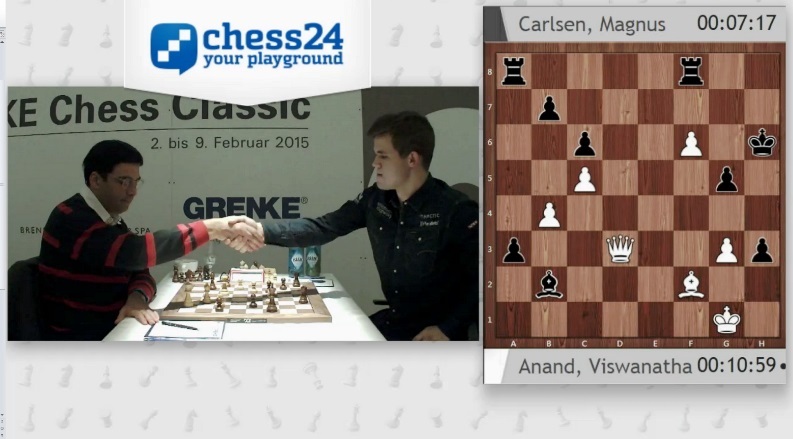 After 11 moves Carlsen has offered up the a-pawn to damage White’s structure. He said afterwards that maybe 12.bxa4 “is not as stupid as it looks” – psychologically it might also have done no harm to remind Carlsen of the way an a-pawn cost both him and Caruana games against Wojtaszek in Wijk aan Zee. 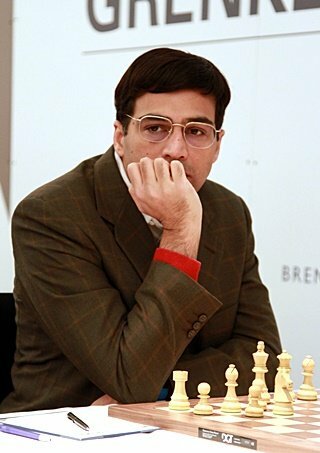 Instead Vishy allowed the pawn to live and Magnus pushed it to a3, though he was far from certain it was a great idea, calling it “probably a bit overzealous” and later “ridiculous”, though it would eventually decide the game. He wanted Magnus to take on c3 later on and he won’t lose the game. This is more of a strategic choice. I generally wouldn’t take on d7 – maybe I’d regret it, but that’s just a matter of style. I have to say I regretted the move h5 later in the game. There are of course some pretty serious risks involved with playing Bb2. I thought for a long time here. It feels like my position should be quite good, but long term… well, there is no long term here, as within a few moves he could get the bishop round to c4. There’s a huge chance I’ll be embarrassingly mated here, but I couldn’t see it. When you play riskily – when you sacrifice material – you should follow it up by playing well. I just couldn’t believe that there was no mate there… I should have done what I did today – try and calculate it and not see any ghosts. Anand, who still had significantly more time on the clock, played 32.Rd7?? after only 52 seconds. 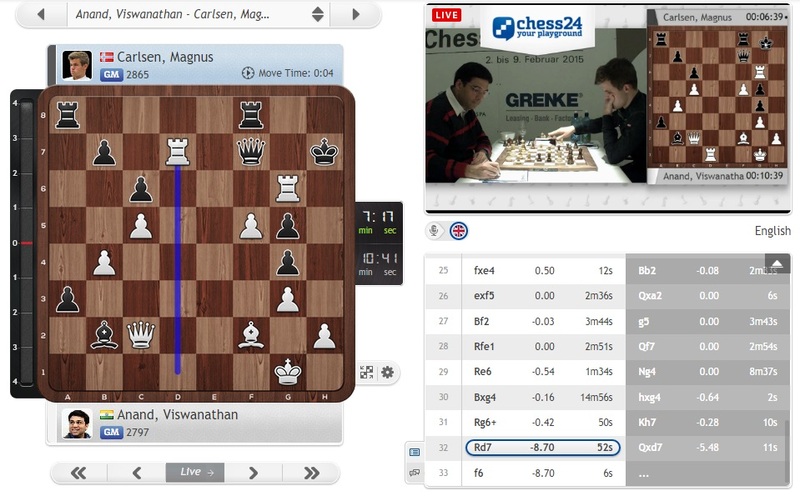 It took much less than that, 11 seconds, for Carlsen to accept the sacrifice, and after 33.f6 the refutation 33…Qd1+! followed almost as quickly. There was no perpetual check and the a-pawn was unstoppable. 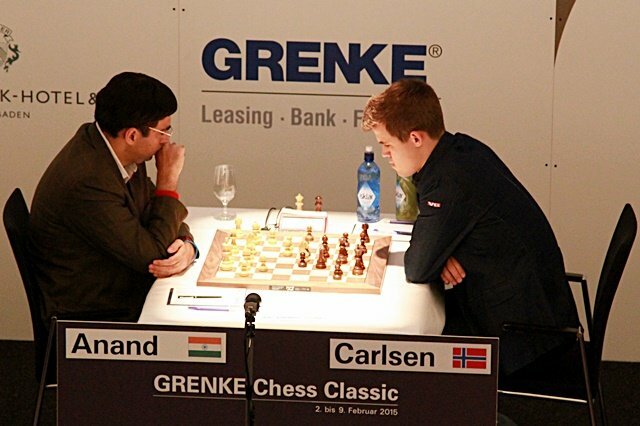 Carlsen admitted he’d been shocked that Anand hadn’t played the only move 32.Re6, when although Black seems objectively to have strong winning chances absolutely anything could happen. Aronian noted that, “this is Vishy’s territory - positions where you have the attack”, and as if to emphasise the point Magnus suggested the move 32…Bf6, when White has 33.Rxf6! Qxf6 34.Rd7+ Rf7 35.Bd4! and although Black may be fine after pushing his a-pawn we’d certainly have a long game ahead. Ok, the final example doesn’t count as a game-losing blunder in itself, but the soul-destroying speed with which Carlsen punished his opponent in each case was notable – as if to emphasise how self-evident the mistake was. Anand can take comfort from the fact that he no longer needs to play any matches against the World Champion in the near future, and they won’t even cross swords again in Zurich next week. The obvious first thought on looking at the Round 5 pairings is that you wouldn’t want to be David Baramidze! But sometimes wounded animals are the most dangerous, and in any case the Naiditsch – Caruana clash will also be vital for the tournament. They have some real history, with Caruana winning two epic games – both from a lost position: see here and here – at the 2013 GRENKE Chess Classic. Will Naiditsch be out for revenge? 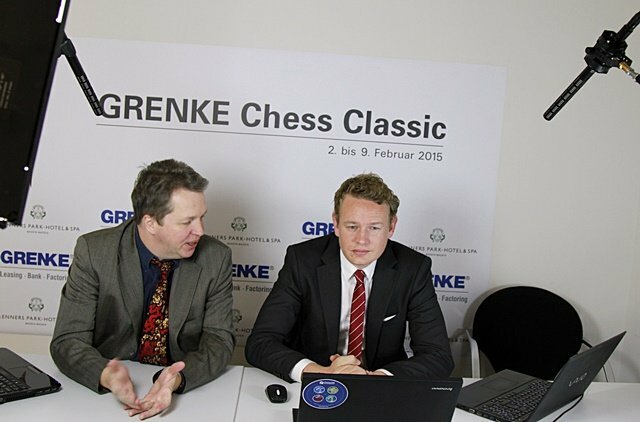 Watch all the action live on chess24 with commentary by Jan Gustafsson and Nigel Short! Aronian: "Magnus' main secret is his composure"